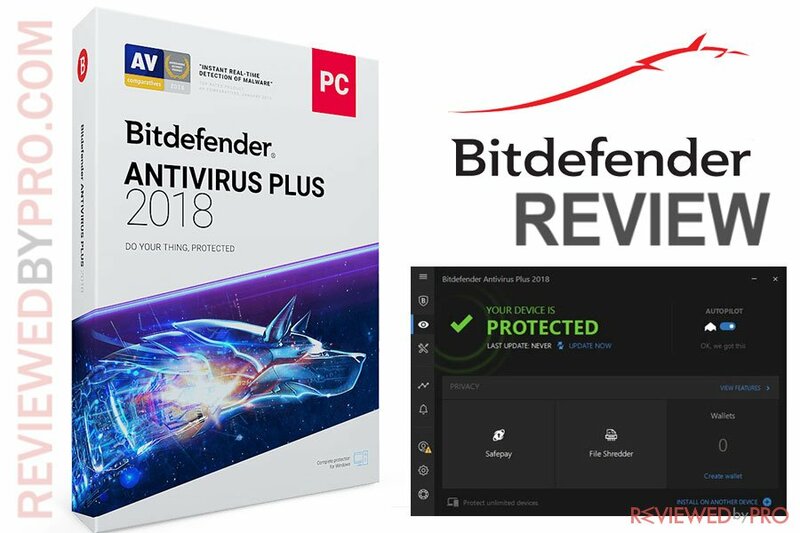 Bitdefender Antivirus Plus 2018 is developed by Bitdefender. This company has been in business for 16 years already, as it has been founded in 2001. The developers are based in Romania and they have made a name for themselves by releasing light-weight and really modern-looking software. Let’s see what they have in the newest version of Bitdefender. Bitdefender offers Windows users three types of different security packages, depending on customers needs. Bitdefender Internet Security is developed for advanced users, Bitdefender Total Security provides users with ultimate protection and Bitdefender Antivirus Plus covers the basics and includes advanced protection for Windows and is light on resources. The entry-level package starts at $40 and can cover up to three devices. Downloading the anti-malware application is really easy, as you can do it on this page. The file isn't big and you will get it onto your computer in seconds. As for the installation, follow the steps provided by the Installation Wizard. Bitdefender Antivirus is available for Windows OS, Mac OS, Android phone and Android tablet. 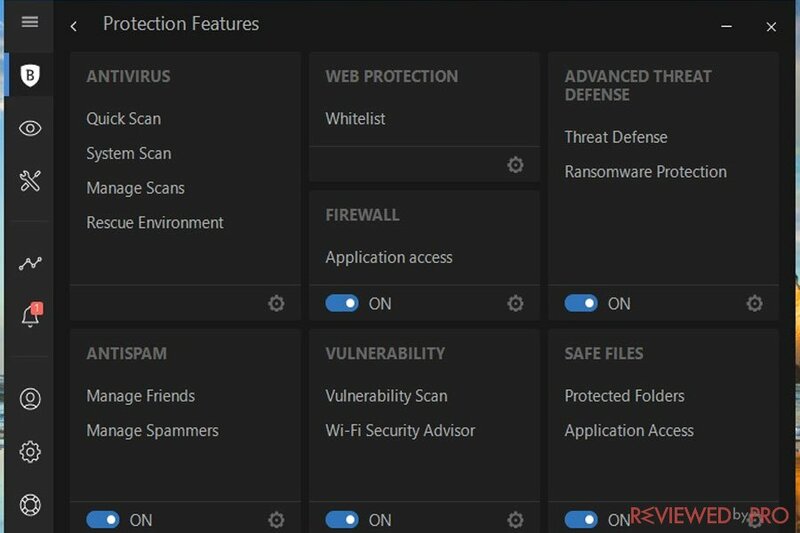 Bitdefender uses the same malware detection techniques for all its Windows products. Bitdefender Antivirus Plus was tested by Reviewed by Pro researchers. Firstly, we carried out a test using different samples of malware. To our surprise, Bitdefender wasn’t that good at first – it hardly removed any viruses at all from the first full scan. However, results got a lot better after a restart of the system. After carrying out a full scan for the second time, about 80% of the malware and viruses have been removed. Even though it took a lot of time, we can say that Bitdefender is quite effective, but you will have to have patience. Another test we carried out is installing malware and spyware on a Windows 10 system with Bitdefender Antivirus Plus already installed. The results looked good at first, as about 50% of the malware has been detected, blocked and quarantined. However, about 20% of the malicious software went through and infected the new PC. There’s another 30% of the malware that seemed to be blocked but left some leftovers in the registry and a few icons on the desktop. In addition, Bitdefender Antivirus system was tested by the independent AV-TEST testing lab. According to AV-TEST test conducted in March – April 2018 results, Bitdefender detected 100% of zero-day malware attacks, including web and e-mail threats and 100% of widespread and prevalent malware discovered in the last month. All in one, Bitdefender Antivirus demonstrates an excellent antivirus protection. Bitdefender successfully identified and blocked 100% of the sites that were using phishing methods. Now another important feature is the anti-phishing system. We have to admit that Bitdefender Antivirus Plus did quite well on that, successfully identifying and blocking 100% of the sites that were using phishing methods. That’s a very rate for any prestigious anti-virus program. Bitdefender Antivirus Plus combines security, performance and privacy features. The package includes Complete Data Protection that works against various kinds of threats such as viruses, worms, Trojans, zero-day exploits, rootkits and spyware; Advanced Threat Defense, Multi-Layer Ransomware Protection, Anti-Phishing, Anti-fraud and Rescue Mode. When it comes to Performance features that helps to increase device’s performance, speed, increase it’s battery life and more. 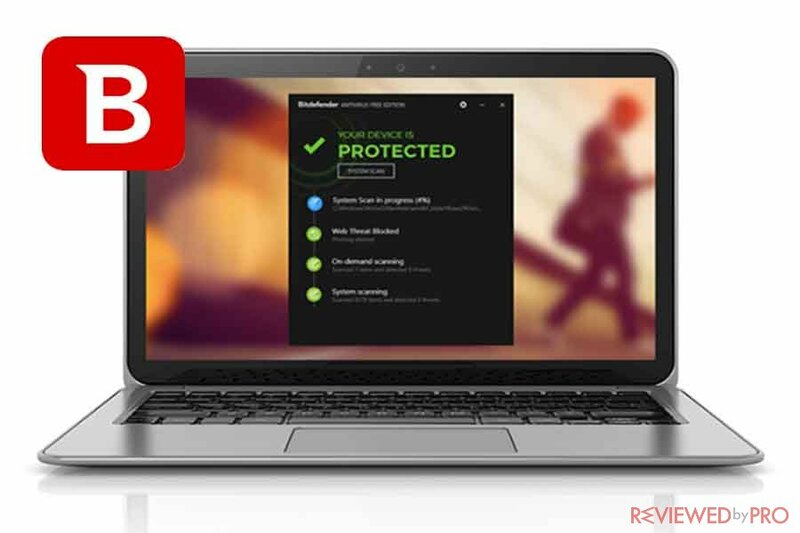 Bitdefender Antivirus Plus includes Bitdefender Autopilot, Bitdefender Photon, Global Protective Network, Game, Movie and Work Modes and Battery Mode. Finally, Privacy features include Bitdefender VPN, Safe Online Banking, File Shredder, Social Network Protection, File Shredder, Password manager and Vulnerability Assessment. We have measured the percentage of the operational memory that has been used by Bitdefender Antivirus Plus when a full scan was carried out. The results were pretty good – the anti-virus software took only 6% of the system’s resources. The only thing that caught our attention is that Bitdefender slows down the start-up of the system a bit – by approximately 20 seconds. However, it could be clearly stated that it is one of the most light-weight applications currently on the market because it almost takes no resources when Bitdefender just runs in the background. In addition, according to AV-TEST, Bitdefender Antivirus Plus does not have a noticeable impact on system-performance and slow downs the system when launching popular websites or using commonly-used applications not more than the industry average. Talking about the previous versions, Bitdefender is known to have a modern user interface with nice colour schemes. If you have used a previous version of this software, then you will notice some differences. However, the new look is quite modern too and it is surely easy to use. When using Bitdefender, sometimes it is not convenient to move from one feature to another, as you can get lost quite easily. 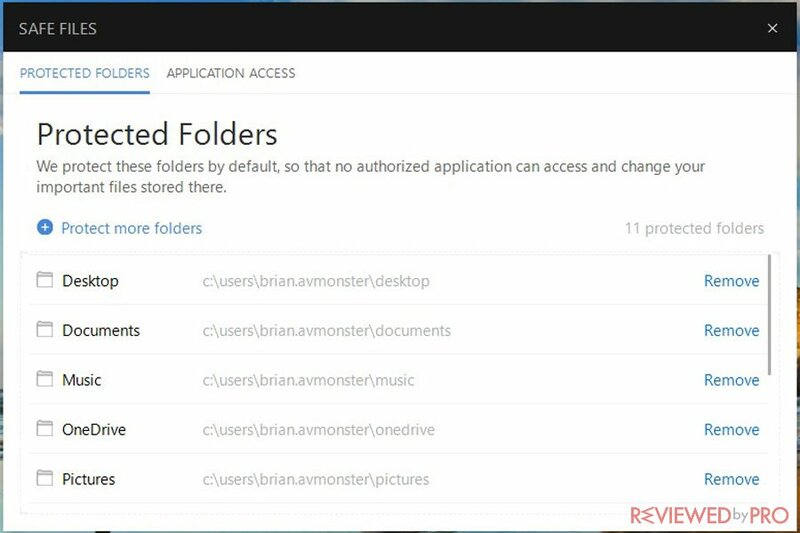 That means the guys at Bitdefender could work on their navigation more – it could have been easier to have a menu on the left and then nobody would get lost in the user interface looking for a feature. Of course, all of the antivirus software has a weak link to its chain and Bitdefender Antivirus Plus is no exception. There are some issues with the technical support part of it, which you may not like. Firstly, even though there is a button on the application that would let you contact the technical team, you will only get a form to fill in and you will not know when they should contact you. There are no time frames and no promises. Of course, you can also try to reach them by email, but that might be just the same difficult case like reaching them by the built-in form. You will have to send your license key to prove that you are a customer with a legal version of the software. If you get infected while using Bitdefender Antivirus Plus, you will need to pay an extra fee of 99$ for their technical team to remove the virus for you. However, some of the other big names in the market can offer you this service totally for free, so this fact doesn’t add an advantage to Bitdefender Plus technical support team. There is one good thing about the support – they have a pretty huge database of frequently asked questions, documentation and various tutorials that you can use to identify the problem you are facing. However, it still doesn’t hide the fact that Bitdefender customer service avoids talking to their customers. As you can see, the new Bitdefender Antivirus Plus has improved compared to its older versions. You can actually feel that these guys were working a lot on the resource usage – it is really one of the lightest programs on the market, so if you have a computer that gets slow very easily, Bitdefender Antivirus Plus might be a perfect choice. All in all, Bitdefender Antivirus Plus is a great anti-virus program with excellent antivirus detection rates and great set of privacy and security features. You can find a lot of customer reviews on the Internet regarding this antimalware application. On the website of Trust Pilot, it is marketed as “great” with the score of 7.8 stars. The majority of the reviews are really positive, praising the program for its quick reaction to malware, friendly customer support, and easy-to-use UI. However, some users complained about slow customer support. 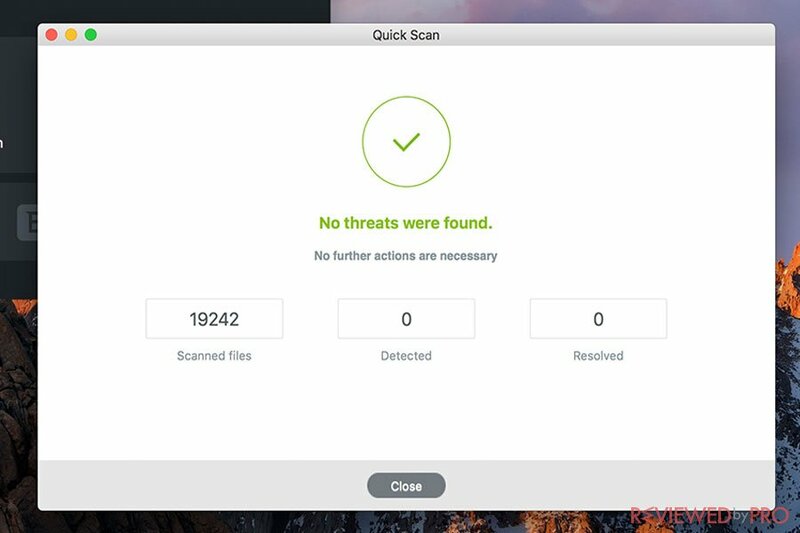 Bitdefender Antivirus for Mac demonstrates excellent malware detection rates and offers advanced ransomware-defenses and family protection features. However, the bad side is the system-performance impact, as the application can slow down your computer noticeably. All in one, Bitdefender Antivirus for Mac is a great solution for those, who look for reliable protection and useful feature set. To read a detailed review click here. Bitdefender Mobile Security and Antivirus is one of the best Android security application in the market. It offers superior anti-malware protection, excellent detection rates, a very comprehensive set of extra features, and even a VPN service. In addition, Bitdefender has an easy to use interface and comes at a very competitive price – $14.95 a year. 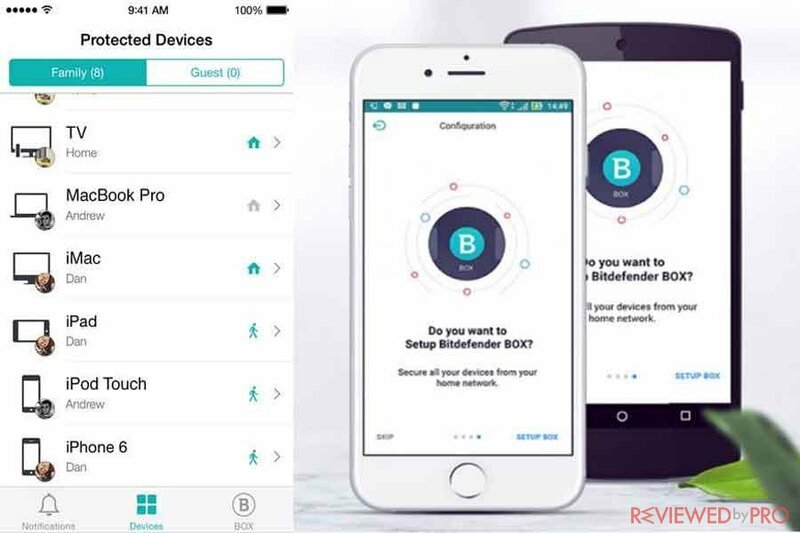 To read a full review of Bitdefender Mobile Security and Antivirus click here. Bitdefender offers its customers free tools in order to increase their PCs security and performance. Bitdefender lightning-fast Free Antivirus that protects your PC using award-winning technology, Bitdefender Home Scanner which helps to increase your network and devices security, Bitdefender Adware Removal Tool for PC and Bitdefender Anti-Ransomware Tool. For more information about Bitdefender Free Tools for Windows, click here. 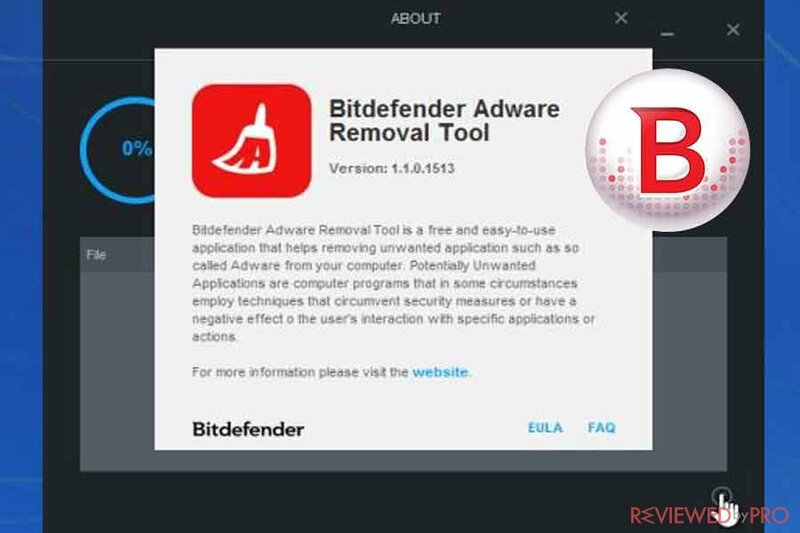 Bitdefender has developed a completely free adware removal tool which removes and blocks any annoying adware, malicious hijackers, toolbars, and other browser add-ons that were installed without user permission. 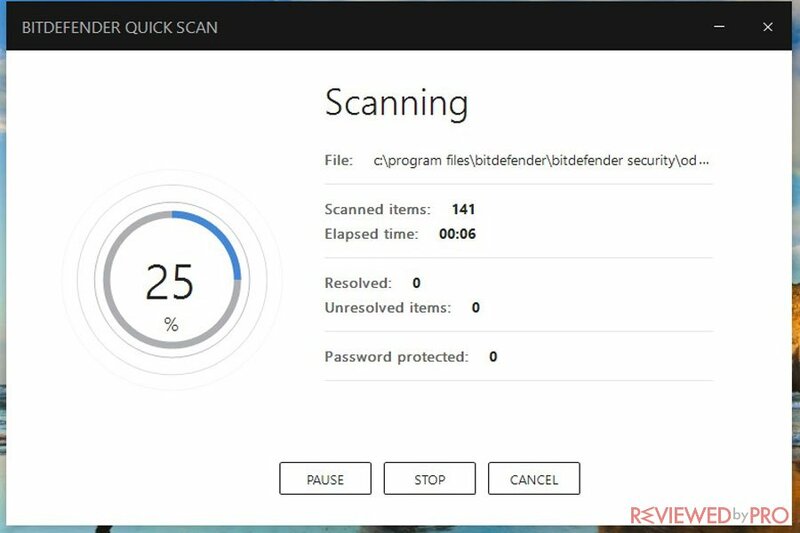 Bitdefender Adware Removal Tool scans your PC, identifies any suspicious adware and other unwanted annoying programs, as well as removes them. As a result, your computer and browser speed increases and runs smoothly without bigger interruptions. If you want to find out about Bitdefender Adware Removal Tool and other free browser cleaners, click here. Reviewed by Pro team strongly advises you to protect your IoT smart devices, in order to ensure your smart-home safety. Bitdefender BOX 2 is a single security solution that protects all your Internet-connected devices and appliances. The security solution provides protection against malware, stolen passwords, spying, identity theft and more. The tool can be controlled on the computer dashboard or a mobile application. To get more information about Bitdefender BOX, a security tool for smart-home devices, click here. Bitdefender AntiVirus and Zemana AntiMalware are similar tools and both offer its customers lightweight security that does not impact the operating system. 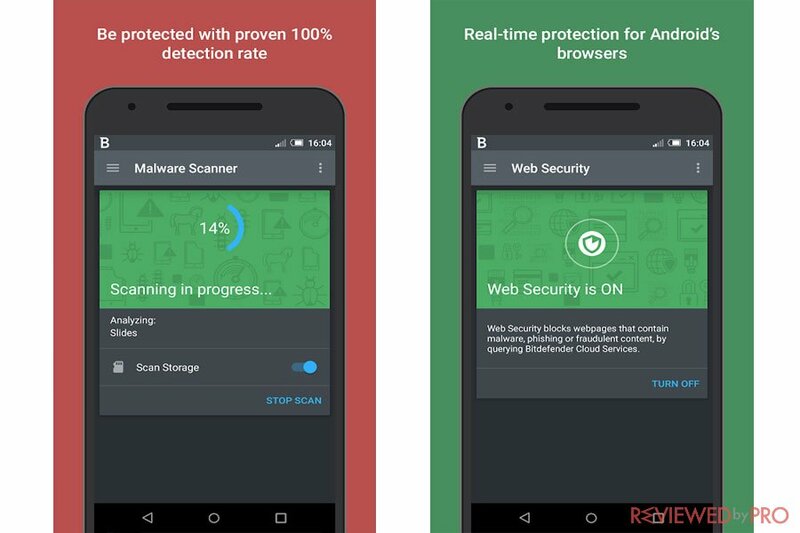 Even though Zemana shows better results in malware detection and removal, as well as real-time protection, Bitdefender Antivirus provides more useful features, such as webcam protection, anti-phishing, parental control and more. If you want to read the full comparison, please click right here. 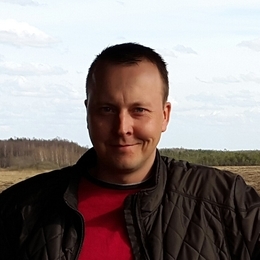 Tomas Statkus is an IT specialist, the team leader, and the founder of Reviewedbypro.com. He has worked in the IT area for over 10 years. ^ Bitdefender. Wikipedia, the free encyclopedia. ^ Malware. Wikipedia, the free encyclopedia. ^ Bitdefender Test Results . AV-TEST. ^ User Interface Definition. Business Dictionary. ^ Bitdefender reviews. Trust Pilot. This entry was posted on 2017-08-16 at 02:14 and is filed under Security.